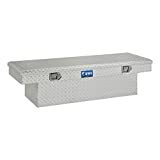 The standard cross-over truck tool boxes are the most popular products with many features and benefits from UWS and just fits right in with today’s modern truck styling. Built 2 inches lower on the bed rail for a better view from the rear window and a sleeker look. A beautiful look with all of the UWS exclusive features; including the remarkable Structural-Foamed Lid; built with features you know are only available on a UWS Product. Everything in one classic design making an exciting change in the look of modern toolboxes. Made to complement the latest new truck designs World Class quality and leading edge ideas only from UWS. The Crossover toolboxes are available in Bright Aluminum Diamond Tread or Topsider Black Powder Coated Aluminum Diamond Tread to fit your work needs and your truck’s style.